Strathmore's Series 400 Paper is an intermediate grade watercolour paper which is popular with watercolourists of all levels because of the fine and even washes that can be achieved when using it. It also has a strong surface that will allow lifting and scraping applications. 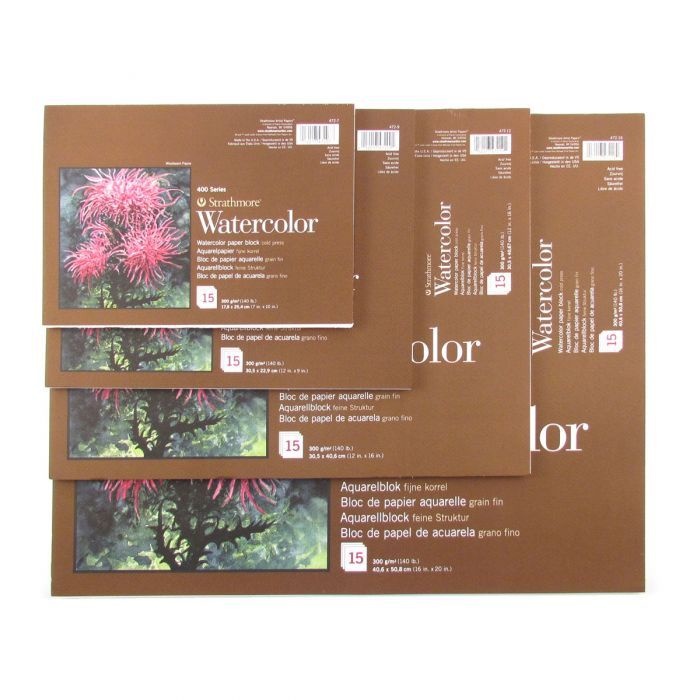 The natural white colour and traditional cold press surface make it an ideal sheet for mastering watercolour techniques or for finished artwork. Strathmore Watercolour Paper is manufactured to exacting specifications, is acid free and buffered to neutralize acid compounds absorbed from the atmosphere or formed through natural aging. Please note that the paper used in these blocks is cut from full sheets which have a distinct top side and underside. Therefore the pages will differ slightly in texture; some being smoother than others. Each block contains 15 individual sheets which are glued on all 4 edges.